Looking for a rare Gulf front condo with three bedrooms? 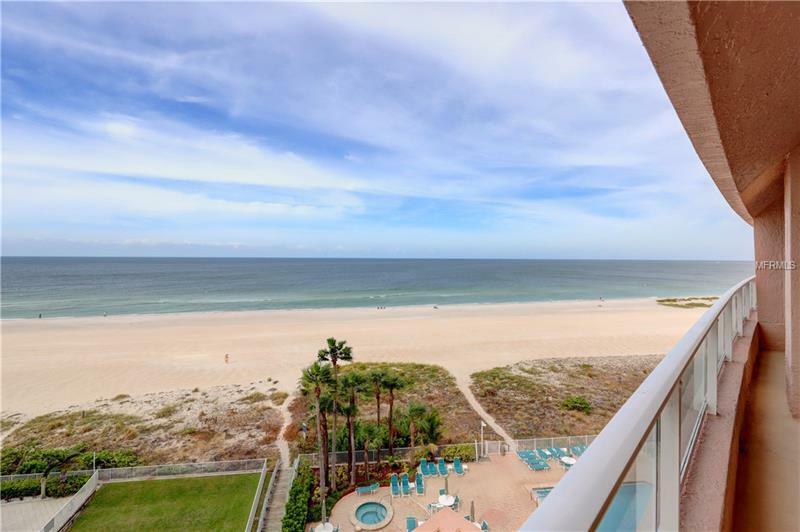 This Crescent Beach Club Gulf front condo, located on Sand Key, features a large great room with ceramic tile, wet bar and sliding doors to a waterfront terrace overlooking the white sands of the Gulf beach. So enjoy sipping your favorite cocktail as you watch the sun dip behind the horizon. The kitchen, with mica cabinets and counters, offers a breakfast area and stainless steel appliances plus a laundry closet with stacked equipment and utility sink. The split master bedroom suite provides a Gulf front terrace and custom walk-in closet plus dual sink vanity, soaking tub and glass enclosed shower. Two bedrooms with custom walk-in closets share a âJack and Jillâ bath and a terrace overlooking the Intracoastal Waterway. Community amenities include a pool, club room, tennis courts, gym, steam room, guard gate and underbuilding parking. Sand Key and Clearwater Beach restaurants and shops are situated just minutes away or you can drive less than ten minutes to numerous services in Belleair Bluffs which include a Publix grocery. Pet Restrictions: 1 pet allowed under 20 lbs.